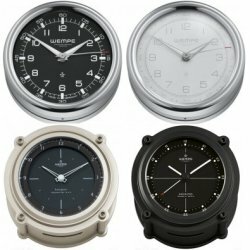 WEMPE's quartz clocks are some of the most popular of the chronometry products and are not only used at sea. They reliable indicate time with their battery-powered quartz movements and are available in many different sizes. Our assortment consists of many different clock types and therefore suit every taste! The first decision to be made: What type of housing? High-gloss polished brass, chrome plated, solid aluminium or stainless steel? There are also man options for the appearance of the clock face: classical white, timeless black, modern anthracite, or with an additional dark brown ring? If you are not only looking for a WEMPE quartz clock, but also cherish other marine instruments we might have a solution: a combined instrumentation panel. The many product series offer the clock in combination with a barometer and thermometer/hygrometer embedded in a wooden board - a very special something.